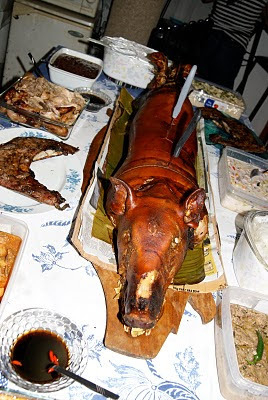 Lechon is probably the favorite pork dish of Cebuanos. I never been to a major party here without this roasted specialty. Even the famous Anthony Bourdain rank Cebu's lechon on top of his hierarchy of pork. Read: bourdain's blog . Lechon is a young pig slowly roasted to become crunchy outside but juicy and savory in the inside. Here are some numbers if you happen to be in Cebu. Prices: it depends on the season and size...typically a whole Lechon can range from 2,500 to 5,000 pesos here in Cebu. When you buy a whole lechon, you are usually given a free dugo-dugo (dinuguan/blood soup). If you buy it by the kilo, it will be around 300 to 500 per kilo. The best parts would be the belly and of course the skin. So if you happen to be in Cebu, try our lechon and taste the difference. I live in yokosuka naval base here in japan.. i would like to know if I can place an order for two lechon. what would be the best way and store or place to get one. will one of the stores you have posted deliver all the way here? PLease let me know. I would like to order for my son's first birth day. Thank you. Kailangan i-dial ang AREA CODE. Kung hindi, METRO MANILA NUMBER ang matatawagan niyo. Dial the AREA CODE otherwise you will be calling a METRO MANILA NUMBER. yup, do not forget to include the area codes if calling outside Cebu. For overseas inquiries, most of the restaurants have experience in handling overseas orders so do not hesitate to call. Let me know about your experience so that we can help others as well.